Home>News of Metal Industry > Why is Stainless Steel good for Cutlery? Why is Stainless Steel good for Cutlery? Although we now take cutlery for granted, it actually took a long time to be developed. The world waited until the 1970s for cutlery to be made out of stainless steel. Yet, what was the deal before then? And why did Stainless Steel prove to be so good for its manufacturing? Back in the days, only rich people could afford silver cutlery, while the masses just had wooden utensils or their hands. When copper arrived, it proved to be good for cooking, but not for eating due to its strong taste. Eating with the hands carried on except for in East Asia. There, the problem was solved with chopsticks! Towards mid-18th century, a metal manufacturer in Sheffield, UK, developed silver-coated cutlery. Copper forks, knives and spoons were coated with a silver layer, which made them less expensive and improved the food’s taste. Yet, this solution was not perfect. Silver still reacts with some foods. Only with the arrival of Stainless Steel, cutlery has finally been properly manufactured with a suitable material, which we now use every day. Stainless steel is an alloy of steel, carbon and about 10% of chromium. Sets of numbers describe the quality and grade of the alloy depending on its components. Some grades of stainless steel may also contain nickel and are usually more expensive. Even at high temperatures, Stainless Steel is very strong allowing for usage within a wide range of temperatures. Not only it is resistant to heat and fire, but also to water and washing in dishwashers. The addition of chromium improves rust and corrosion resistance. When exposed to air, chromium forms a layer of oxide on the item’s surface. This is non-toxic and provides protection from air and moisture. Even if the metal gets scratched, the chromium oxide self-repairs. 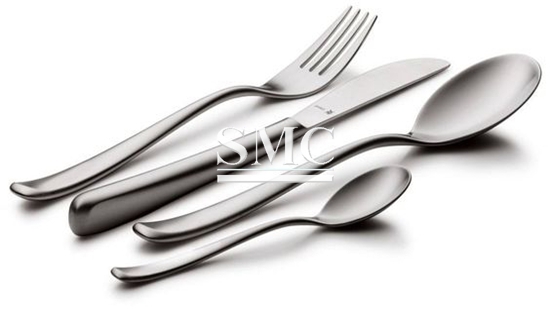 However, the main property that makes of stainless steel a perfect choice for cutlery is the ability of ensuring hygienic standards. The alloy is neutral in contact with food and non-reactive. Thus, even acidic foods can safely be prepared and cooked by using this alloy. Finally stainless steel is durable and aesthetically pleasant. At Shanghai Metal Corporation, we have developed a wide range of Stainless Steel products. Thanks to our team, we proudly supply the food industry with high-quality equipment, such as Stainless Steel Sink, Alcohol Tank, and of course with Stainless Steel Cutlery (Stainless Steel Flatware). For more information and a full list of products, please click here.